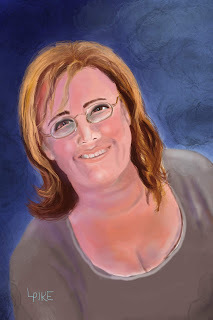 Another new digital painting. I have never painted a horse before and it was a challenge getting the proportions of the features correct. This is way out of my normal subject matter and I am no horse expert but I had fun painting this. The composition was from my imagination and with the help of research photos I studied, I was able to get the face to resemble a horse. 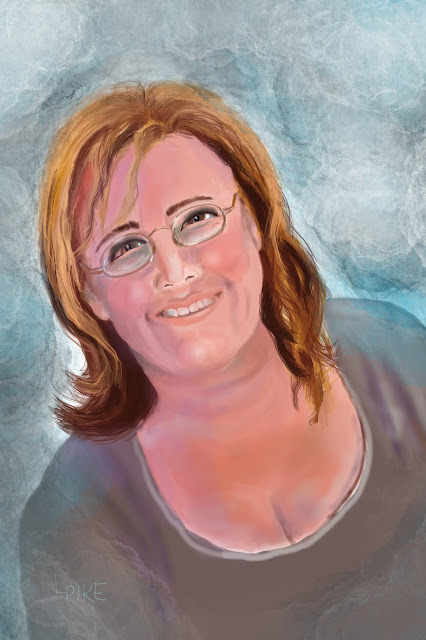 As before with my daughters portrait I did this digitally using the Procreate App. For some reason my son was harder for me to do. I spent much more time on it and it probably still needs some adjustments. I use photos that I have taken for reference but I do not trace them. I start out with a pencil drawing trying to get the features as close as possible then I move on to a new layer and start painting. 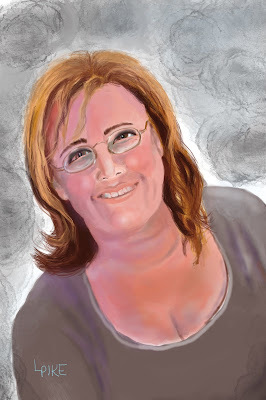 So far I like using the acrylic brush and the airbrush and the smudge tool. I also do the features on different layers so I can scale and move them if needed. When I get to a certain point I start merging all the layers into one and then start detailing on another layer. It is great to be able to edit, cut and paste and rearrange until you are happy. Also working in layers you don’t get muddy colors or overworked areas. I am slowly thinking this will be the way of future artists. Hopefully digital art will become more acceptable and valued as an art form. It still takes an artist to create the art. The app and the computer is just another tool as is the brush, canvas, and paint. The last two days I have been working on this portrait of my daughter. 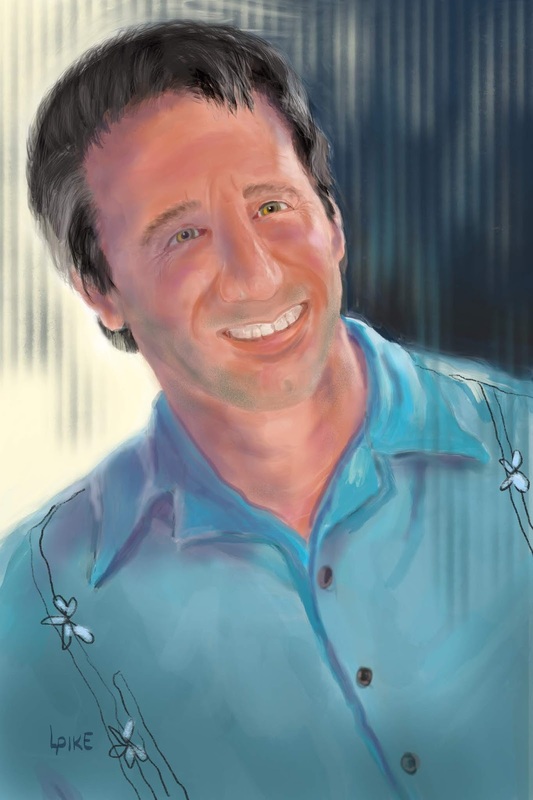 It was digitally painted with acrylic in the Procreate app. It is all hand drawn and painted, no photoshopping. The fun thing about digital painting is you can try out different things on different layers such as background colors, to see which looks better. Below are several different background versions. All are still saved in my layers so any one of them could be printed. This is a piece I just finished. It was a bit challenging to get the finished look I was after. 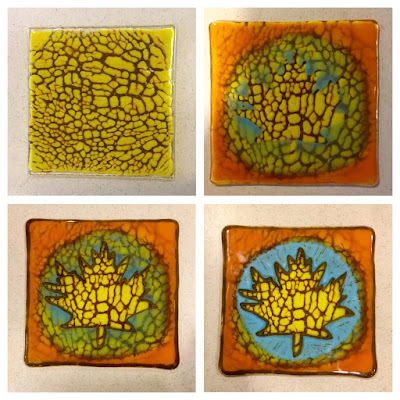 I did the first two firings as a crackle project with the yellow and brown veining. 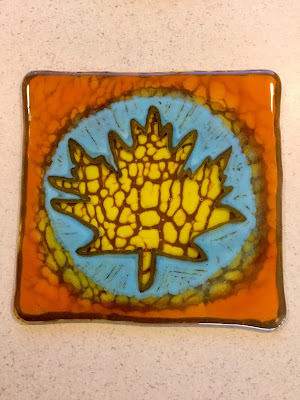 It seemed a little boring to leave like that so after the second fuse with clear sheet glass on the top I then sifted orange and blue powder frit over a leaf stencil I created. I full fused that but the blue came out to light. So I decided to add a dark brown line of liquid glass made of gel and powder around the leaf and around the outside edge. I then full fused again. The blue still was not to my liking so I made liquid glass again and applied using a squirt bottle in a thicker layer. Now I fused again. Finally I found that to be acceptable. The leaf popped out more and so did the crackle in the leaf. In person the depth of the layers is more evident. If you are interested in the crackle effect Bob Leatherbarrow’s book is a good reference for that. 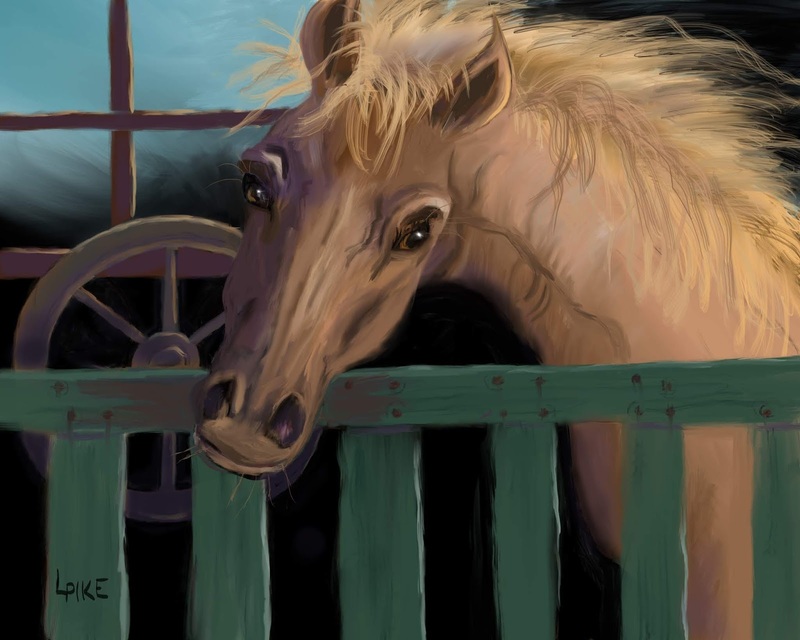 This is a video of a recent digital painting I did using my iPad and the Procreate App. I created my own digital brush to paint the planter and create its earthy texture. This is a digital painting I did using the Procreate app on my iPad Pro. It is painted on many layers. The neutral background layer of the Lilies was sketched awhile back in Procreate. I imported it in for my background layer. I like the neutral colors letting the butterflies take center stage. Painting in layers is also a good way to create collage type painting/art. See my digital art at https://society6.com/lyndapikearts. Art prints of my work are available as well as on many different products perfect for your home or gifts. 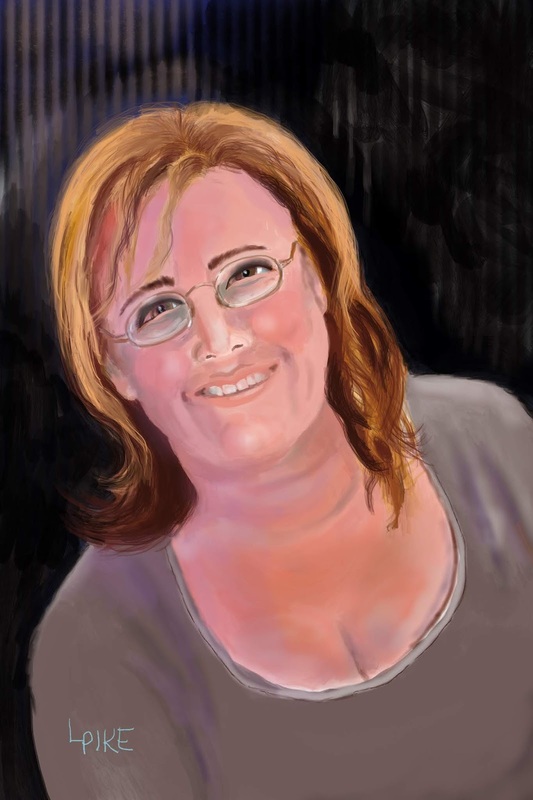 I’ve been practicing my digital painting and also working my way through an online digital drawing and painting course using the Procreate app. Procreate is one of the best digital painting/drawing apps I’ve used. I have used it for quite some time but there are lots of things I haven’t discovered about using the app so I decided to buy into an on line workshop. It has proven to be worth the money as far as learning the mechanics of the app. One of the things I’ve learned is to use the drawing guide and the symmetry tool. 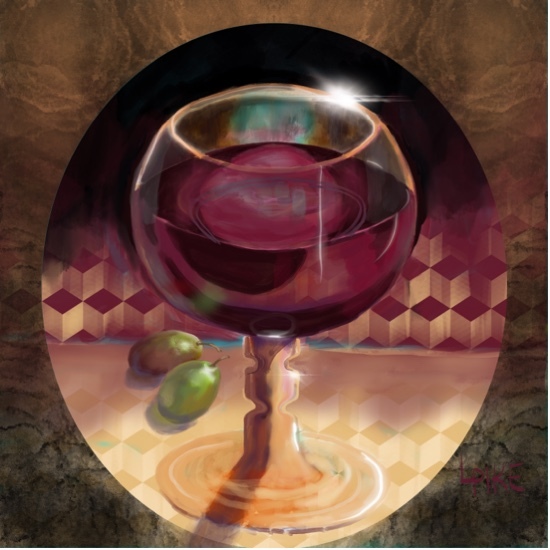 It is very helpful in drawing objects that have a symmetrical form as in the wine glass. I have softened some edges so it doesn’t look to mechanical after the initial drawing. That choice is up to you.